The Preservation Society has recently completed a major, multi-million dollar restoration of Chateau-sur-Mer's roof, which protects the treasured woodwork, wallpapers, stencils and furnishings inside. Chateau-sur-Mer (1852) is one of America's great Victorian houses. Victorian society looked to a future built on industrial wealth and science, while its art looked to the past, inspired by a romantic fascination for history, nature, and adventures in exotic lands. Chateau-sur-Mer is a landmark to all of these Victorian interests. With a vast fortune in the China Trade, three generations of the Wetmore family lived at Chateau-sur-Mer and worked with some of the nation's leading architects and landscape designers to make the estate one of the most palatial in Newport. Italian woodwork, Chinese porcelains, Egyptian and Japanese Revival stencils, and rare trees from Kentucky to Mongolia are just a few of the precious things assembled by the family on this most remarkable estate. Prominent in international trade and finance, society, politics, and art, the Wetmores were a major presence in 19th century life and Chateau-sur-Mer was the backdrop for all of their activities. George Peabody Wetmore served as Governor of Rhode Island and as a U.S. Senator. His daughters, Maude and Edith, were art collectors and preservationists. Upon the death of Edith Wetmore in 1966, Chateau-sur-Mer faced an auction and imminent destruction. 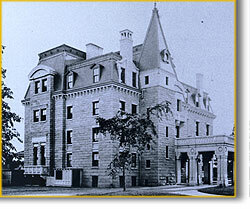 The Preservation Society of Newport County intervened and saved the house and fine park of trees. Today, the estate is a National Historic Landmark and a place where the romantic atmosphere and cultural values of the Victorian Age are preserved in the picturesque grounds and richly crafted rooms. Read research reports about the Wetmore family. Check the reading list for additional sources of information.